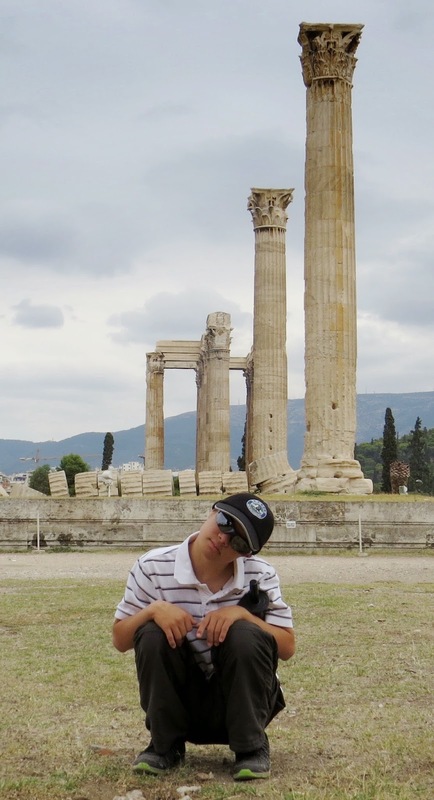 Last fall, we made a sort-of-last-minute trip to Athens, Greece to take care of an eye condition for my younger son, Tian Tian. When you think of medical tourism, Athens isn’t the first place that comes to mind. 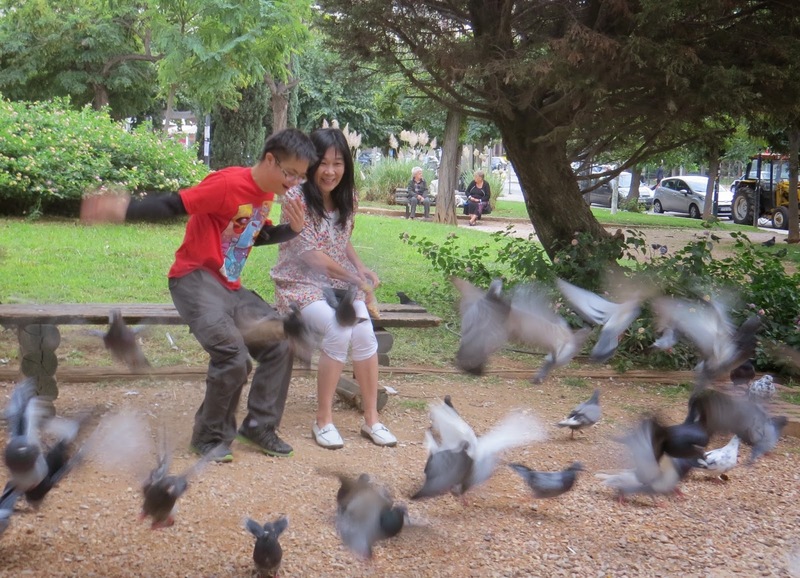 In fact, people there often raised their eyebrows and said, “We usually go to your country for that.” But for our son’s condition—keratoconus—one of the best corneal surgeons in the world happens to work in Athens. I’m glad he works there and not, say, Syria. We found an apartment through Airbnb and chose to live like regular Athenians, or rather Athenians that couldn’t speak Greek. It was fun living in a normal neighborhood, shopping at the supermarkets and bakeries, and acting like we’d lived there our whole lives—except we got lost a few times. Plus, it was a lot cheaper than a hotel. 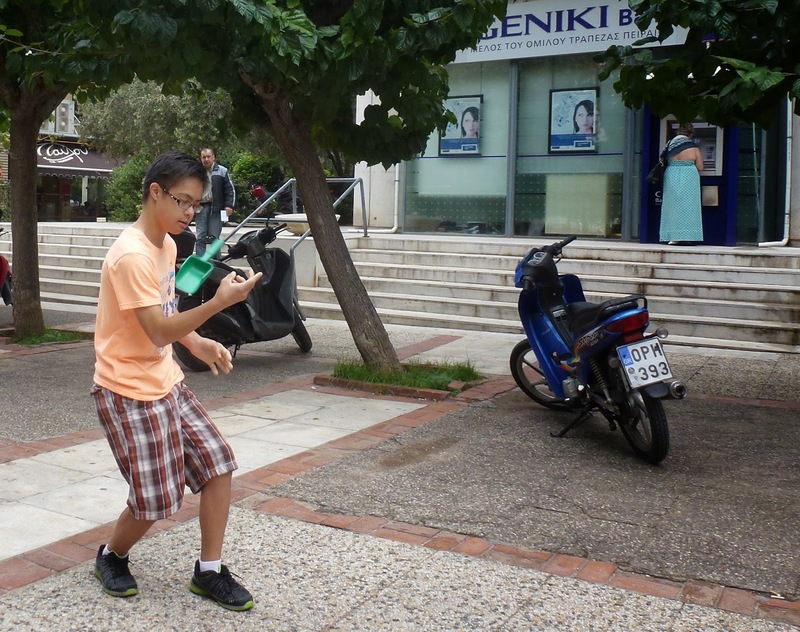 During our ten days there, nearby shop owners and residents started to recognize us and wave at us like old friends. It’s the kind of place I could definitely live long term, though the air quality was a little iffy. After Tian Tian’s eye procedure, the doctor wanted to see him every day, which meant we couldn’t take any trips to the beach or the countryside. But we had a little free time, and Tian Tian recuperated quickly, so we decided to visit the local sites—you can’t go all the way to Greece and not do at least a little sightseeing. One afternoon, we went to the big Acropolis Museum, the Parthenon, the Theatre of Dionysus, the Roman Agora, and other ancient and very Greece-ey places. It seems you can’t take more than a few steps in Athens without tripping over something ancient. One restroom had a ruin right in the middle of the floor—they just built a glass ramp over it so you could bask in the glory of Ancient Greek culture while taking care of other business. After spending the afternoon visiting lots of old stuff, we decided to head back to our little apartment and cook dinner like normal, non-tourist folks do, so as to not strain Tian Tian too much. Before heading to the bus stop, we found ourselves in Monastiraki Square as the sun set and the full moon rose, surrounded by tourists, locals, and the sounds and scents of Greek culture and food. It was tough to leave such an exotic and beautiful scene, so we bought chicken gyros, barbecued corns-on-the-cob, and drinks, then sat down on the steps to enjoy the atmosphere. A very talented young man started a live concert, playing about a dozen different types of flutes. The ethereal sounds of his music floated through the crowds and echoed off the buildings. The full moon brightly lit the busy square. The Parthenon glowed on its perch above us, overlooking the city like a friendly sentinel. And the gyros and corn tasted great. As we sat there listening to the music, a small crowd of African immigrants slowly gathered on the stairs around us, also enjoying the concert and drinking a lot of beer. One man in his thirties started a conversation with Tian Tian and the two became instant friends—our son seems to have that affect on people. 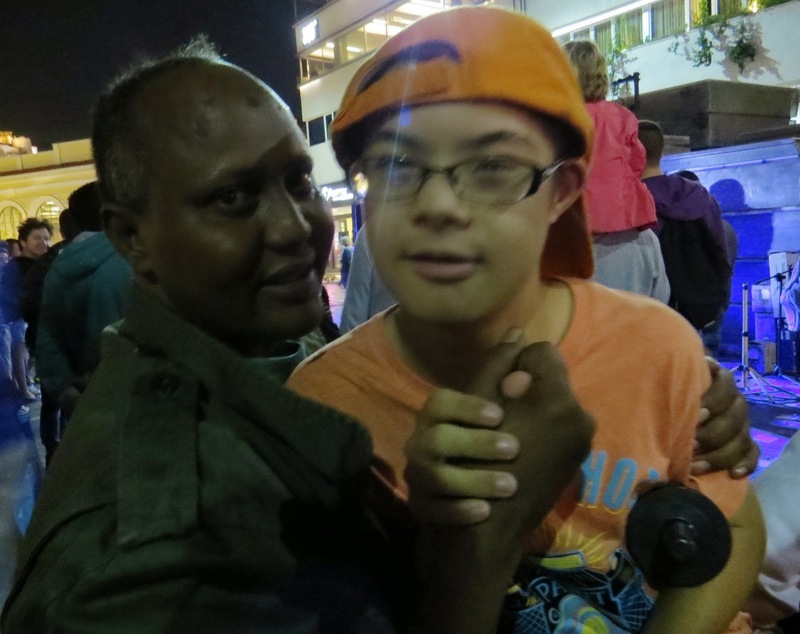 We couldn’t understand all of his English, but he told how he was orphaned in Somalia when younger, and later came to Greece looking for work. (He picked a rather inopportune time, given Greece’s economic issues.) He had a brother with a disability similar to Tian Tian’s, who has Down Syndrome. I don’t know how much of his story was true, or how much of it was the beer talking, but he was a very friendly guy and helped Tian Tian forget the problems with his eyes and how tired his legs were. Given that we were in a foreign country, surrounded by immigrants of another culture and language, and it was well after dark, I think some people might have been nervous in a situation like that. Well, maybe I’m just naïve and like to see the good in people, but I felt very safe and comfortable there. In fact, if Tian Tian wasn’t so tired, I would have wanted to stay there all evening, listening to the flutes and talking with our new friends. We eventually took a very harrowing taxi ride back to our apartment and retired for the night. But I’ll always remember the evening our family of three from America joined a small crowd of Somalis in downtown Athens listening to flute music under the full moon.